A clean and compact pocket invitation style, a pocket card is a single flat card with a pocket on one side. 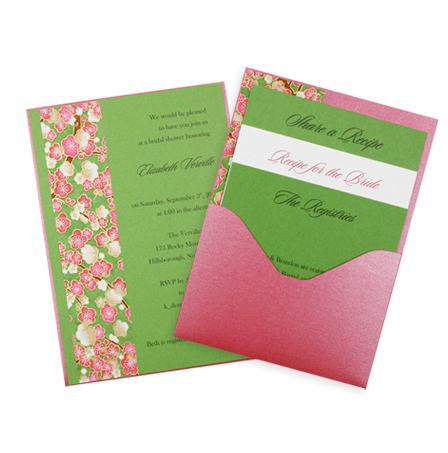 Most often you would insert your invitation card and other invitation ensemble pieces directly into the pocket. In other creative scenarios we have seen the printed invitation card glued to the back and the pocket space used for direction, reception, and response cards. 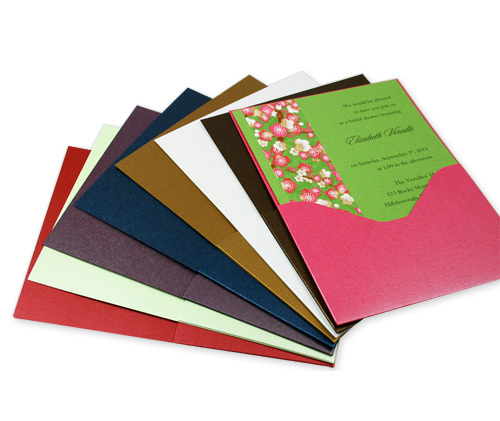 Pocket Cards measure 5 x 7 inches and accommodate a 4 7/8 x 6 7/8 inch card or smaller. Pocket cards fit inside A7 5 1/4 x 7 1/4 envelopes. Pockets are made with thick, heavyweight card stock. Metallic pocket cards are 105lb Stardream card stock that is finished on both sides with a shimmery coating. Wood grain pockets are heavily embossed on one side with a distinct, lifelike wood grain texture. All the Perks of a Pocket Fold, No Extra Bulk. It's Like a Pocket Fold Light. Consisting of a single 5x7 Card with an attached pocket, pocket cards have all the style and convenience of a pocket fold, but without all the extra bulk. It's as if someone came along and chopped the bottom portion off of your pocket folds, and a pocket card was born! No extra flaps; no extra panels - just simple, streamlined style. Keep It Light & Simple. Insert a Single Invitation Card. Keep your pocket card design simple by inserting just a single invitation card. It's a great way to jazz up an otherwise traditional invitation design and to add a splash of color. What Fun is a Pocket if You Can't Put it to Good Use? Why Not Toss in an Extra Card or Two? Why not put that handy pocket to good use? The beauty of pockets is their ability to neatly organize all of the "stuff" that goes into invitation ensembles - you know; response items, reception card, direction card, wedding website card - the list goes on. Why place all of those items loosely in an envelope, when you can place them neatly and securely in a stylish pocket? Too Crowded in That Pocket? Stick Your Invite to the Other Side! If you find your pocket card is looking more stuffed than stylish, streamline it by taking the invitation card out and sticking it to the other side. Let your beautiful invitation stand alone in the front, and the additional information sit neatly in the back. Like that layered look? 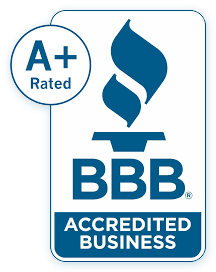 Here's how we did it! These Pockets Are Too Cool to be Used Just for Invitations. What Else Can I Place in That Pouch? Pocket cards are great for invitations of all occasions, but are also great for save the dates, greeting cards, thank you notes, party favors, and more! Along with a card, throw in a photo, some confetti, some candy - any little trinket you can think of. Space for a personalized card and a pocket to fill with your items of choice? The possibilities are endless!